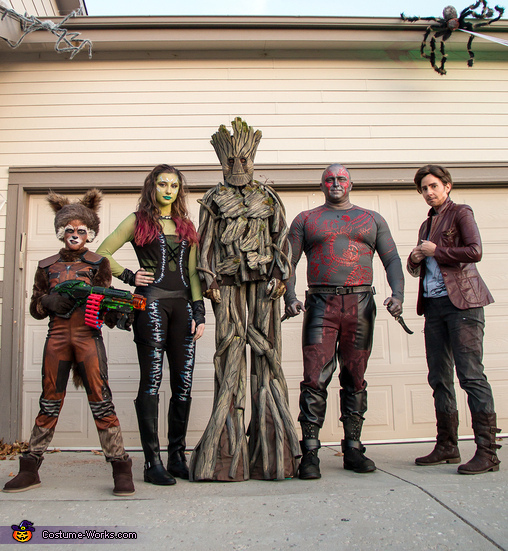 Our family of 5 (Mom is Star Lord, Dad is Drax, oldest daughter Sydnee is Gamora, middle daughter Charlee is Groot, and youngest daughter Justee is Rocket) dressed as Guardians of the Galaxy. We love the movies and thought it would fit us to be these characters. Most pieces of costumes were found at thrift shops and altered to work. Groot is made out of pipe insulation foam tubing glued to pants and sweater and painted and textured to look like wood. The bark is cardboard. The mask is made from a rubber floor matt. We also made some block stilts for Groot to walk on. I made Drax's "scars" by using fabric paint on a grey shirt. The scars on his face (and the silver on Gamora's face) are the same type of paint painted on a mirror and allowed to dry; then I peeled them from the mirror and applied to face.